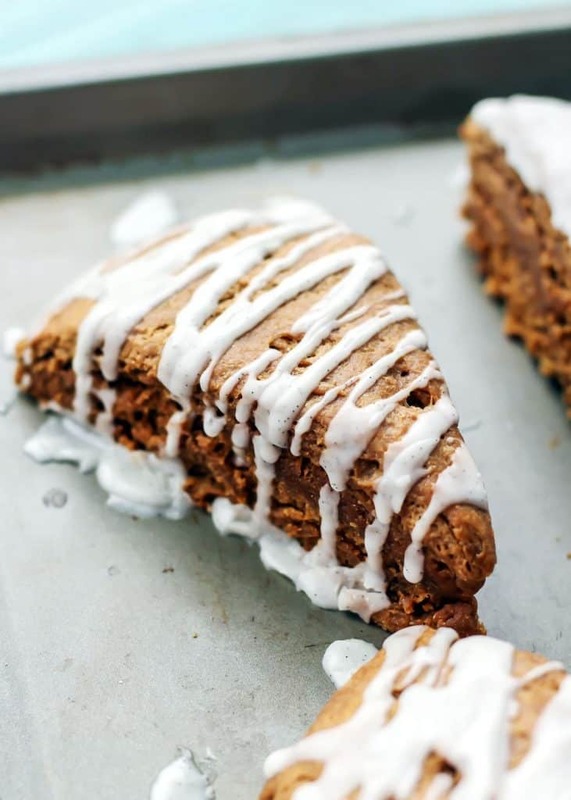 Whole wheat and vegan GINGERBREAD SCONES. The flavor in these scones is out of this world. 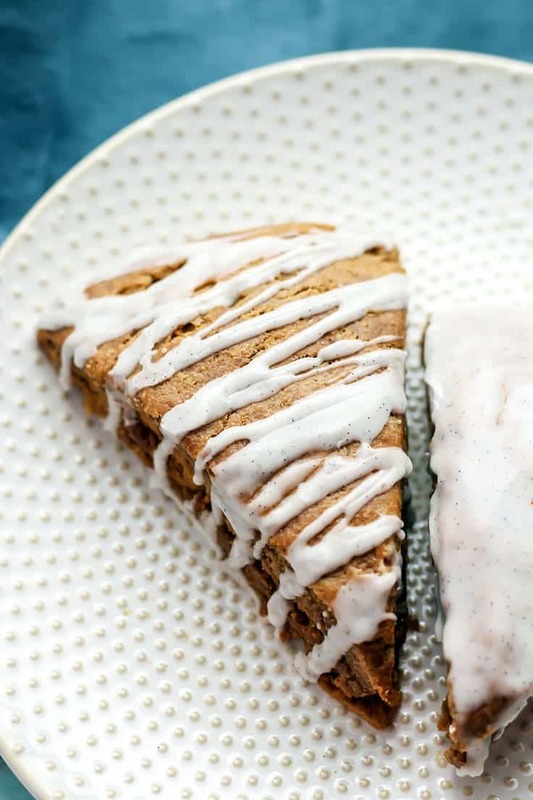 Sweetened with molasses for the classic gingerbread flavor and topped with vanilla bean glaze. So it’s my 28th birthday today… Gosh that feels weird to say! I am 28 years old… and I don’t write this with a somber tone. I write this with more of an inquisitive tone… Like, I am 28 years old? What does that mean? What does that look like? Well, these days 28 is looking fairly rough, I have to say. Working about 60 hours a week from home, messy hair, maybe putting on makeup once a week and constantly having to check the mirror before leaving the house to make sure there aren’t any ingredients on my face… yeah. Mentally speaking however, 28 is feeling pretty damn awesome. Looking back on my 27th year of life, it’s most definitely had it’s ups and downs. I’ve learned a lot about myself–this year especially. 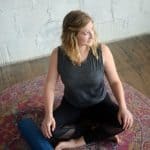 I think when you find yourself in high-stress circumstances, it helps to take time and reflect… to stop and think about how you process things. And to learn from those moments and grow. So this year I’ve learned to celebrate the little things in life, including my birthday. I’ve never been one to truly celebrate my birthday. It always felt weird to me. Maybe it’s the whole “center of attention” thing I don’t care for. But this year I am changing my perspective and celebrating the day I came into this world. It is just a day, but it is a pretty awesome (birth)day, so why not embrace it? Oh did you guys want to talk about some (birthday) gingerbread scones? COOL, me too. Some of you may be like “What the heck? Where’s the cake? 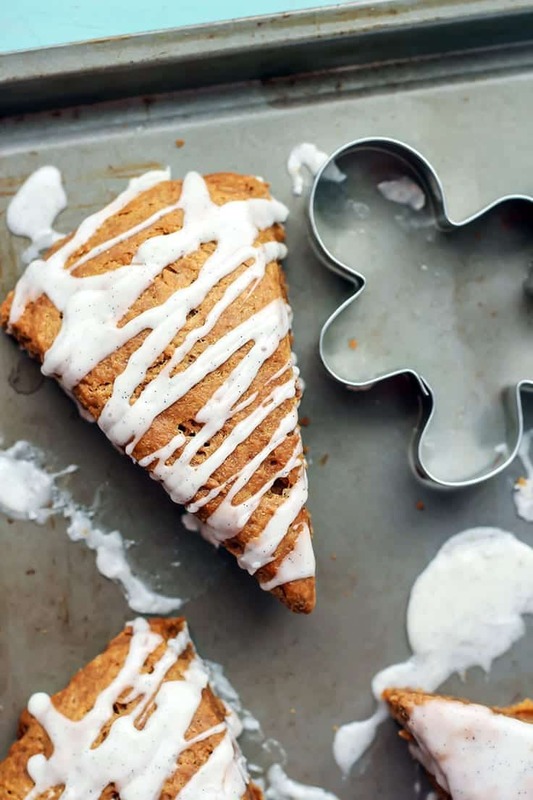 !” But for those of you that know me well, these gingerbread scones should come as no surprise to you. Truth be told I am not a huge cake person. I am not sure if it’s because I have a bajillion cousins and it seemed as though twice a month we were celebrating birthdays at my Nana’s house with grocery store cakes (sorry, just not my favorite)… or if it’s the super sweet frosting I don’t care for… or if I just love ice cream and cookies that much more. And obviously these scones are not even close to cookies or ice cream in the slightest. 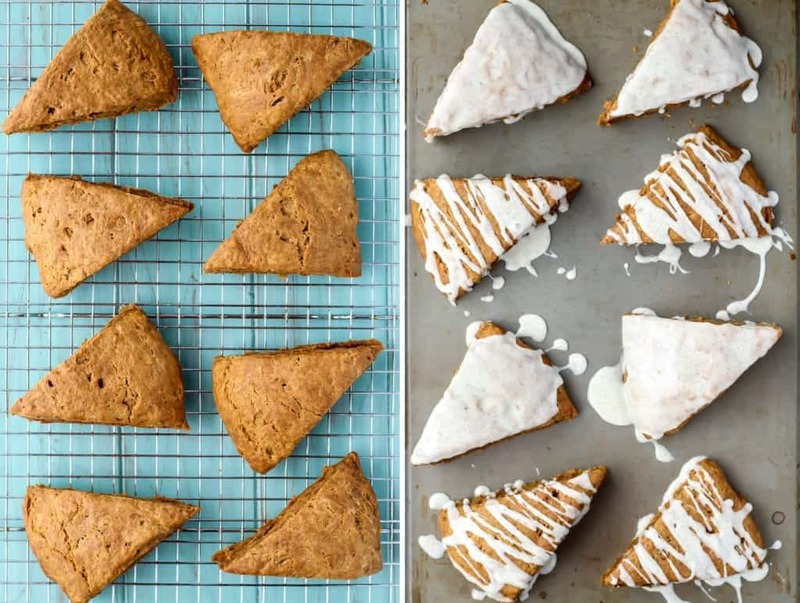 But I’ve been waiting patiently all month for the perfect time to share some gingerbread scones with you and today just happened to work out perfectly. 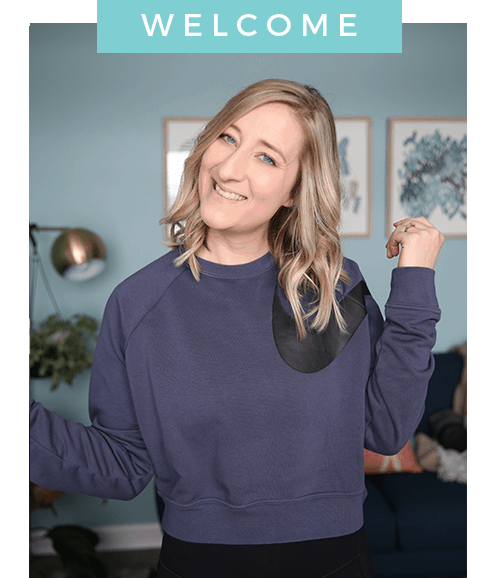 Truthfully I have so many seasonal recipe ideas written down for this month that I may just have to go into January with some of them. There are just not enough days in December for all of the holiday flavors I want to share! They’re perfect with a cup of coffee (or tea!) and have just the right amount of molasses flavor. I had to make a couple adjustments from my tried and true chocolate chip scones. But after a couple test batches these gingerbread scones are ready for the world! 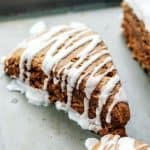 These scones can be made in a bowl, grating the coconut oil and working it in to the dry ingredients with a dough blender (as I show in my other vegan scone recipes) OR the scone dough can actually be made in a food processor. I’ve heard some feedback that the frozen coconut oil is a little hard to grate. Which, I won’t lie, it’s not the easiest thing to do. But the reason for this is the frozen coconut oil helps with the crumbly texture of the scones. If you use more softened coconut oil the scones become much more fluffy and bread-like. Anyways, I wanted to show you that if you have a food processor, you can actually process the frozen coconut oil into chunks with the dry ingredients and you’ll achieve the same results for the dough! 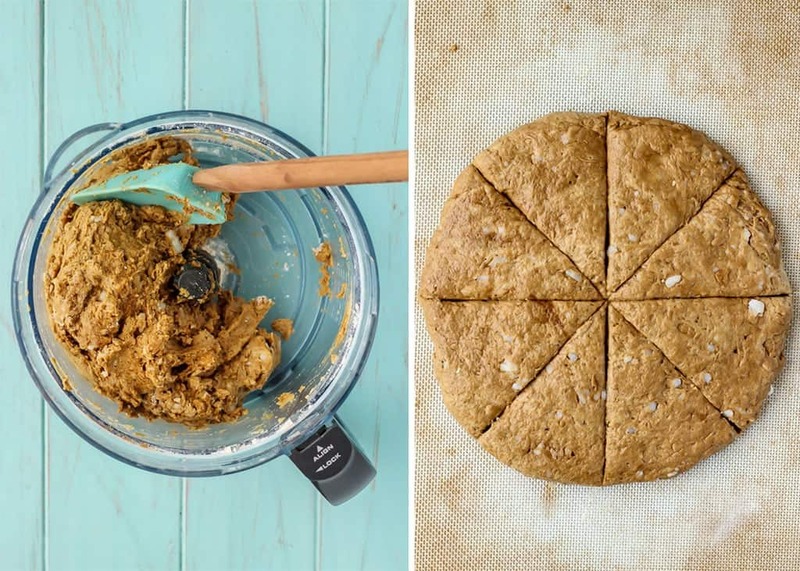 Once you break down the frozen coconut oil with the dry ingredients, you just gently incorporate the molasses and milk, shape the dough into a circle on a lined baking sheet, slice and bake! 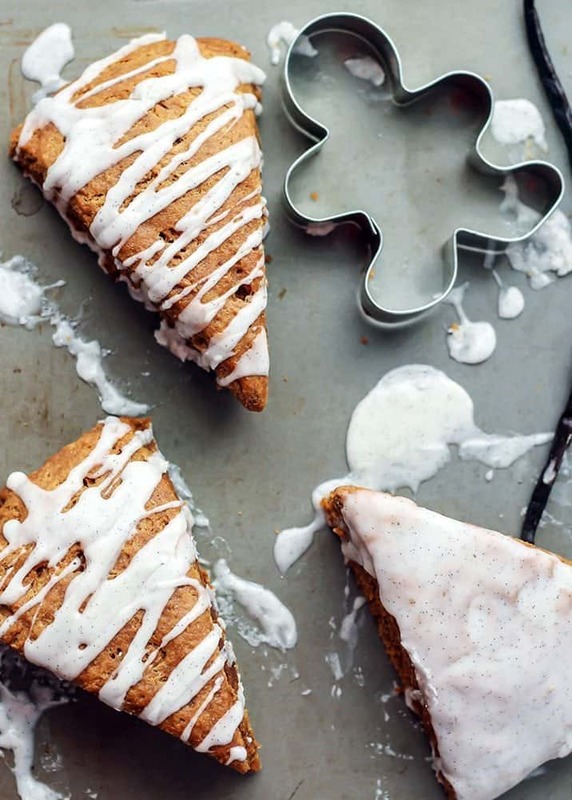 And while these gingerbread scones are great on their own, a little vanilla bean glaze was kind of necessary, don’t you think? Preheat oven to 350F and line a large baking sheet with parchment paper or silicone mat. Set aside. In a large mixing bowl–or bowl of food processor–add flour, baking powder, salt, ground ginger, ground cinnamon, and nutmeg. 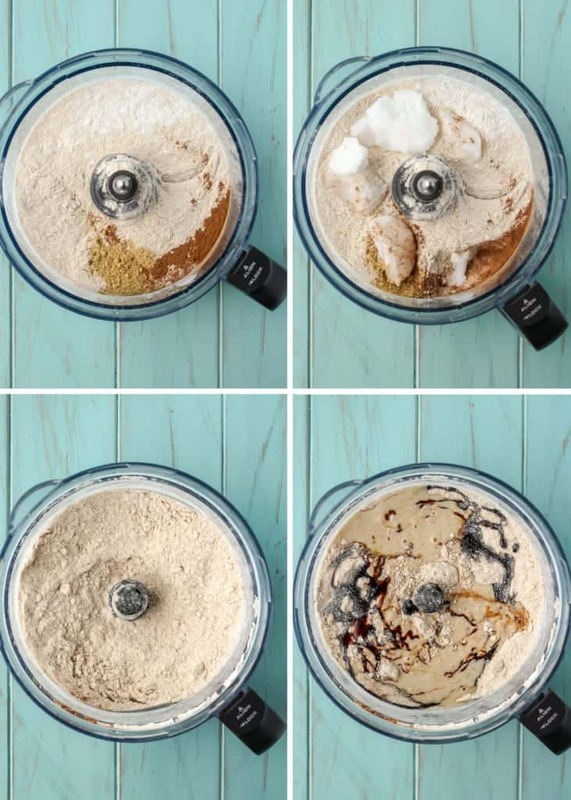 Whisk until well combined and set aside–pulse dry ingredients together if using food processor.. The frozen coconut oil can either be grated into large bowl of dry ingredients, then blend using dough blender until a grainy meal-texture forms. OR using the S blade of the food processor, process frozen coconut oil with the dry ingredients until broken down into small chunks. Gently stir in the coconut milk, molasses, and vanilla extract to bowl of dry ingredients with a large spatula (remove blade from food processor bowl). The dough will be thick and sticky. With floured hands, shape dough into large circle, about 8″ in diameter, on prepared baking sheet. Using a large, sharp knife, make 8-10 triangle slices into dough. Once the scones have cooled (about 20 minutes on wire rack) make the vanilla bean glaze: slice down vanilla bean and scrape out seeds into medium bowl. Add powdered sugar and milk, whisk together until smooth. Place baking sheet under wire rack before pouring glaze over scones. Allow glaze to dry, enjoy! **canned coconut milk yields the best texture, but you can sub with almond milk, cashew milk, etc. Happy birthday!! Let me know how 28 is… I’ll be there in Feb 😀 These scones look amazing! They totally beat birthday cake in my opinion! Hope you have a great day celebrating! So far so good 😉 Thank you Christine! The icing on these looks seriously AMAZING. This looks like a beautiful birthday treat. HAPPY BIRTHDAY ASHLEY! 🙂 I didn’t know that you are just 28, because it seems like you are years ahead of me in your accomplishments and blog work. I LOVE watching you grow and bake and learn and share about your life. Happy Happy Birthday Ashley! I hit 28 in August and it was totally weird… 28 just sounded really old in my head compared to 27. But I’ve been loving on 28 a lot 🙂 And I would expect nothing less than a new scone recipe from the QUEEN of scones on a day like today!! lol the sound of 28 does kind of feel a little weird… but I’m just going with it 😀 Thank you Ellie! Happy birthday!!! 🙂 28 will be wonderful for you!! And these scones!? Delish. The perfect birthday treat! Ah thank you for letting me know! These are just sweetened with molasses, so no additional added sugar. I just fixed the instructions. Thanks again 🙂 Hope you enjoy! !